Celeste Ng in her home office in Cambridge; she writes about race and class in America in her new book. When Celeste Ng’s first novel, 2014’s breakout Everything I Never Told You, started being reviewed, she says she complained to her husband, “ ‘People are reading my book!’ He had to remind me that was the point.” The novel, which follows an Asian-American family as it grapples with the death of a teenage daughter, was a best-seller and won accolades and awards, including Amazon’s Best Book of 2014. Such success explains the 20-city book tour for Ng’s new novel, Little Fires Everywhere, in which multiple lives collide in a seemingly perfect suburban town. Ng (pronounced “ing”), 37, studied English at Harvard, then earned an MFA in creative writing at the University of Michigan. A decade ago, she moved back to Cambridge, where she lives with her husband and son. This interview has been edited and condensed. What was the experience of the success of your first book like? It’s incredibly rewarding to have people come up to me at readings and say, “I’m not Chinese, but this is the relationship I have with my mother.” Or say, “Your book made me think a lot about my parents, and I’ve decided to sign up for counseling.” That is mind-boggling. Was it intimidating to embark on another novel after the success of your first? It was, and it was encouraging, too. With the first novel, I had to tell myself no one is ever going to read it, so you might as well just write it. With the second, I was pretty sure someone was going to read it. Why did you make your hometown (Shaker Heights, Ohio) the setting of your latest book? I wanted to write about the complexities of this place that had shaped me. I loved growing up there. It’s very idealistic. My parents [who emigrated from Hong Kong in the 1960s] moved there because it was known for being racially integrated. There is a race-relations group at the high school. They do activities with fifth- and sixth-graders like talk about what is a prejudice, what is peer pressure. I did that. I didn’t realize until I went to college that it was anything unusual. At the same time, I see the flip side of that idealism. You can get fined if you don’t mow your lawn. Two-family houses are set up to look like a single house, with just one doorbell. It’s done to prevent a stigma, but it’s weird that a two-family house has a stigma. Is there a character in the book that is close to you or had some of the same experiences? I took different aspects of my teenage life and split it up among the kids in the book. Lexie and Trip are the kids I wanted to be, cool. I would have loved to date Trip. But I was much more like Moody, Pearl, and Izzy, kind of awkward, kind of geeky. Like Izzy, I had this idealistic spirit — she is what I would have been if I had been bolder. Do you feel you are expected to be an Asian-American writer? That’s the question I ask often myself. With the first novel I was concerned I would be pigeon-holed as an Asian-American writer, and the book would be labeled for Asian-Americans only. With this book, I did have people ask me if it was also going to be about Asians. They’re in there but that’s not all I’m thinking about. I really wanted to look at how people who have the best intentions are unaware of the blind spots they have, the prejudices and privileges they have. Since the presidential election, do you feel that you have had to defend your home state? I wrote Little Fires Everywhere and sold the book in 2015, still the Obama years. The possibility of a Trump presidency was not on my radar. The book now reads a little bit differently. It’s interesting to hear people talk about Ohio as one of the places where there’s a lot of populist discord. If you live in Ohio, you know that Cleveland, Columbus, and Cincinnati are very different places from the rest of the state. I’m reading these stories about rural Ohio voters and that’s what people think of as Ohio. I think of [the state] as being Cleveland. How has the current political scene influenced you as a writer? It’s made me rethink what I think of as political writing. In 2015, if you asked me if I were political, I would have demurred. What became clear is that I don’t have the privilege of doing that. In early 2016, I would tweet something I thought was fairly innocuous and trolls would start tweeting at me all kinds of racial slurs and threats. People look at my picture and see my name and say, “Oh, you aren’t one of us.’’ I don’t have an ability to stay out of this discussion. I have to be political because I’m a person of color. I’m a woman. I’m a child of immigrants. I have a sister with a disability. How do you deal with the trolls? There was a while where I would respond with quotes from Hamilton, just for my own joy. On the worst days, trolls will call on their friends to bother me, what they call “dog piling.” If the messages are anti-Semitic, I contribute $5 for every post to the Anti-Defamation League. If they are misogynist, about how women deserve to be raped, I’ll donate $5 to Planned Parenthood, and then update the total. Then the trolls quiet down. This book focuses more on class differences than racial issues. Why is that? I wanted to look at those class differences because I have those within my own family. My husband is a lawyer. I have a master’s degree. My parents have PhDs. I also have aunts and uncles who have GEDs who work in food service. That’s all part of what I grew up with. It is especially highlighted in Shaker Heights, with all the ways they try to disguise who are renters and who owns a house. Might you set a future novel in Cambridge? I don’t know. It’s really hard to write about the place that you are in because it’s hard to see it clearly. Cambridge has a lot of the ideals of Shaker Heights that I love. It’s very diverse. That is one of the reasons we wanted to live here and have our son grow up here. The other thing that has influenced me is what a very activist community it is, almost to the point of parody. It is a place where people live by what they say. That’s very inspiring. What one thing would you tell fiction writers starting out? — I’ve been reading her work. Adrienne Rich, I read her a lot in college and wanted to go back to her, and I just got Maggie Nelson’s Bluets. 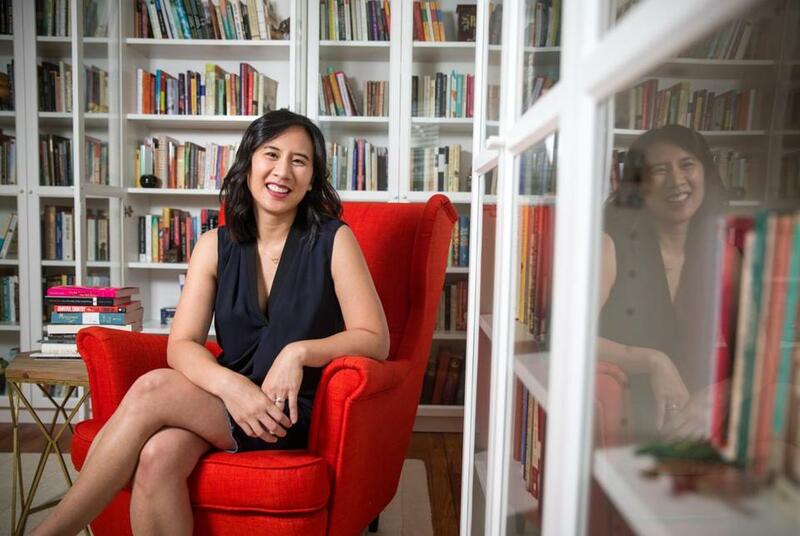 Celeste Ng kicks off her book tour at Porter Square Books September 12 at 7 p.m. Amy Sutherland, a best-selling author in Charlestown, writes the Globe’s Bibliophiles column. Send comments to magazine@globe.com. Follow us on Twitter @BostonGlobeMag.